Mike Winther proved this season it's not how you start, but how you finish that counts. After a rough first two months, the Prince Albert Raiders center turned his season around and made a positive impact on the NHL scouts who watched him. In his second season in the Western Hockey League, Winther finished second on the Raiders with 32 goals and fourth with 56 points. NHL Central Scouting placed the 5-foot-11, 175-pounder No. 21 on its final list of North American skaters eligible for the 2012 NHL Draft -- a five-spot improvement from where he was in the mid-season rankings released in January. He played in the CHL/NHL Top Prospects Game in February -- he had the primary assist on Team Cherry's lone goal -- and had a goal and an assist to help Canada win the bronze medal at the 2012 IIHF World Under-18 Championship. "He's sneaky-good," Central Scouting's Peter Sullivan told NHL.com. "He's very deceptive with his skating. Not breakaway speed, but enough speed to get in and out of trouble in close quarters. … Mike has great on-ice awareness. He knows where guys are before they even get there. He does the little things that aren't in the book and you can't explain; you just have to see it for yourself." That's pretty high praise for a player who had just eight goals and 15 points in his first 29 games. 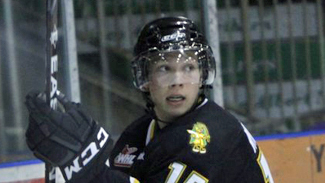 As the sixth pick in the 2009 WHL draft, it was hoped Winther could help the Raiders climb the WHL standings. However, he had just 10 points in 61 games in 2010-11, and those struggles continued at the start of the 2011-12 season. "Coming up as a bantam … he could put up good numbers, but his confidence grew as he learned he could play without the puck," Prince Albert coach Steve Young told NHL.com. "A lot of those kids come up [to the WHL] and they've had a lot of success at the bantam level with the puck. He was willing to make that adjustment. There was some pressure, but some constant words to him to make sure he developed his game that way." It was a slow adjustment, especially early in the season. However, Young knew Winther had enough talent and hockey sense to figure things out, and said the breakthrough came during an October trip through the U.S.
"We were in games that were close hockey games," Young said. "There's times in close hockey games that you have to adjust from being all offense to helping out on defense. He figured out, 'I could do those things.' From then on he got more comfortable and more confident." The results soon followed. He had 11 goals in 11 games in December, and 14 points in 10 games in January. "He found himself with the puck more because of his play without the puck," Young said. "He was in situations to get pucks. It did snowball and got him more chances offensively." "Mike has great on-ice awareness. He knows where guys are before they even get there. He does the little things that aren't in the book and you can't explain; you just have to see it for yourself." It took a while, but Winther finally grew to understand that playing strong in all areas of the ice will make him the kind of well-rounded player NHL teams are looking for. "If you want to play in the NHL you have to play at both ends of the rink," Winther told NHL.com. "It's a mindset and you've got to work your [tail] off to be good defensively." Young believes the slow start to the season was just what Winther needed, and now that he's had success playing the right way, he sees it as just the beginning of what the young center is capable of. "We believe there's more coming that way," Young said. "He definitely showed the kind of player he can and has to be to make that next step."